Gail Loretta McHugh (Nee: Ovelson) - Edmonton's Burial & Cremation Professionals | Trinity Funeral Home Ltd. It is with deep sadness that the family of Gail McHugh announce her passing, after a hard battle with cancer. 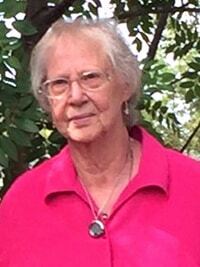 Born in Tofield, Alberta, Gail is survived by her husband of 53 years Ron; sisters; Ann Johnston and Joyce Hippisley. She is also survived by her children; Pamela (Glen) Biswanger; Steven (Terri) McHugh; and grandchildren Amanda (Marty) Paquette; Hannah, Jennifer and Danielle Biswanger, and William McHugh, as well as numerous nieces and nephews. Gail, a regular fixture at the Wetaskiwin Farmer’s Market, will be fondly remembered for her wonderful sweaters and knitting, which have been proudly sent to many countries across the globe. Gail was predeceased by her sisters; Laverne deKergommeaux, Debra Clark; brother Wayne Ovelson; brothers-in-law, Robert Hippisley, Grant Johnston, Bernie deKergommeaux and nephew Allan deKergommeaux. As per Gail’s wishes there will be no funeral services. The family would like to express their sincere gratitude to Dr. Ward and the nursing staff at the Wetaskiwin Hospital and Care Centre. In lieu of flowers, donations can be made to any Cancer charity or to the Wetaskiwin Medi Lend society. Pam & Steve, I’m so sorry to hear about your Mom. Please know that you are in my thoughts and prayers as you move through this difficult time.